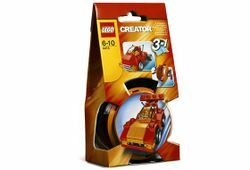 4415 Auto Pod is a Creator X-Pod set released in 2006. The pod is transparent red with orange lids. This set includes 56 pieces and instruction booklets for three models, one using the pod lids. It's recommended for children aged 6 through to 10. Facts about "4415 Auto Pod"
This page was last edited on 9 January 2016, at 17:19.